The Articles of Incorporation for the Schoolcraft County Economic Development Corporation were first completed on September 14, 1981, and the SCEDC was first established by Resolution of the Schoolcraft County Board of Commissioners on March 16, 1982. On December 18, 1984, a joint city/county Economic Development Corporation was approved under the authority of the Schoolcraft County Board of Commissioners. From that moment on the Schoolcraft County EDC has worked tirelessly to deliver sustainable economic opportunity to the area. Let the Schoolcraft County Economic Development Corporation help you with all your transitional needs. We have all the resources necessary to assist your business in growth. Long time residents looking to start a new business or are thinking about expanding current operations. Assisting in company relocation to our business friendly community. Helping companies expand in our logistically strategic location. Human Resources and Strategic Planning. We are here to help! Along with our network of partners and business members, the SCEDC can assist in everything from business plans and lending to real estate development. The mission of the Schoolcraft County Economic Development Corporation (SCEDC) is to help sustain and improve the quality of life for every resident and organization of Schoolcraft County by working in each of these seven strategic areas – Higher Education, Education and Workforce, Business Growth & Development, Natural Resources, Tourism & Seasonal Residents, Infrastructure, and Health Care – and by collaborating locally, regionally, nationally and internationally. Working with our network of partners, the Schoolcraft County EDC brings resources to area business owners and potential businesses that they otherwise may not have access to. We can assist in everything business related from teaching QuickBooks and working with local government on zoning, to securing funds through local lending institutions and securing state and federal grants. In 2009 Michigan Works, the Upper Peninsula Economic Development Alliance (UPEDA), and the Small Business & Technology Development Center (SBTD) conducted a comprehensive economic study of the entire Upper Peninsula and the Wisconsin counties that border us. This study was a call to action to accelerate the pace of change and direction of the economy of Michigan's Upper Peninsula (UP) and two adjoining Wisconsin counties. Our region faces long-term economic challenges from a rapidly shifting national and global economy. Further, the study identified seven strategic areas of focus. 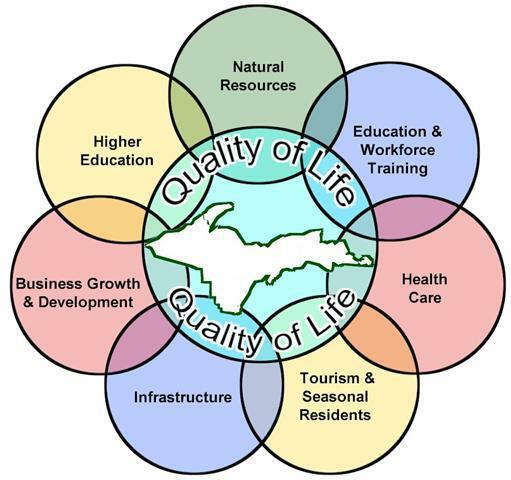 Each county has an interest and a direct economic benefit through the successful implementation of these strategies: Higher Education, Education and Workforce, Business Growth & Development, Natural Resources, Tourism & Seasonal Residents, Infrastructure, and Health Care.